Rod Taylor was interviewed on this talk show hosted by Joni Baillon on KMTV-3, a TV station in Omaha, Nebraska. This installment was titled "Conversations with the Stars" and aired in prime time. Rod would have been promoting "The Oregon Trail," which was scheduled to premiere on Sept. 21, 1977, on NBC. KMTV was an NBC affiliate at the time. Other guests on the half-hour show were Jane Pauley, co-host of NBC's "Today" show; Jack Klugman, star of NBC's "Quincy, M.E. "; and MacDonald Carey, the patriarch of the NBC soap opera "Days of Our Lives." 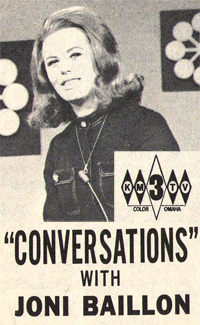 The show's host, Joni Baillon, had been a popular local radio personality before launching the "Conversations" series in 1969. "Conversations" continued into the early 1980s and was among many quality daytime talk shows that populated local TV stations throughout the United States during this period. The shows featured the issues of the day, tackling controversial topics and performing public service -- and occasionally talking to celebrities. The prime example of this genre came out of Dayton, Ohio: "Donahue." As Phil Donahue's show moved to Chicago (and eventually New York City), it grew in popularity and was syndicated nationwide, eventually stealing audience from the local talk shows and changing the talk-TV landscape.